I grew up in Allen, Texas attending St. Jude Catholic Church. After graduating from Allen High School, I spent my first year of college studying music at Collin College. When I began to hear God calling me in a new direction, I transferred to Franciscan University in Steubenville, Ohio. I was part of what is now known as the Priestly Discernment Program and active in music ministry; and, after 4 years there, I graduated in 2009 with a Bachelor of Arts in Philosophy and Theology. 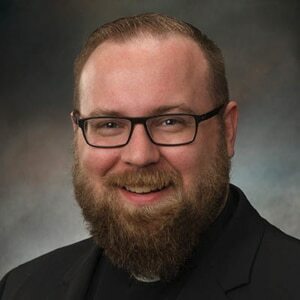 Upon graduation, I was accepted as a seminarian for the Diocese of Dallas and went into formation at St. Mary’s Seminary in Houston, Texas, where I earned a Master of Divinity degree. I was ordained on the Feast of the Visitation, May 31, 2014, by then-Bishop Kevin Farrell, D.D. I spent my first three years as a priest at St. Ann Catholic Church in Coppell, Texas. This past year was my first at Holy Trinity Seminary, and I’m very excited to see what this next year has in store!